This series of modern classics about the charming Penderwick family from National Book Award winner and New York Times bestseller Jeanne Birdsall is perfect for fans of Noel Streatfeild and Edward Eager. Over one million copies sold, now with a bright new look! This summer the Penderwick sisters have a wonderful surprise: a holiday on the grounds of a beautiful estate called Arundel. Soon they are busy discovering the summertime magic of Arundel’s sprawling gardens, treasure-filled attic, tame rabbits, and the cook who makes the best gingerbread in Massachusetts. But the best discovery of all is Jeffrey Tifton, son of Arundel’s owner, who quickly proves to be the perfect companion for their adventures. The icy-hearted Mrs. Tifton is not as pleased with the Penderwicks as Jeffrey is, though, and warns the new friends to stay out of trouble. Which, of course, they will—won’t they? 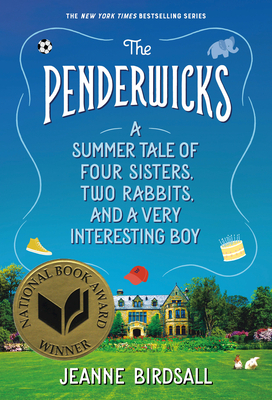 One thing’s for sure: it will be a summer the Penderwicks will never forget. Deliciously nostalgic and quaintly witty, this is a story as breezy and carefree as a summer day. When JEANNE BIRDSALL was young, she promised herself she'd be a writer someday--so she could write books for children to read and enjoy, just as she did at her local library. She is now the author of the Penderwicks series: The Penderwicks, The Penderwicks on Gardam Street, and The Penderwicks at Point Mouette. She lives in Massachusetts with her husband.